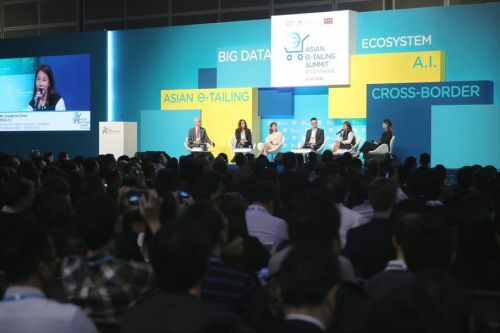 HONG KONG, Dec 6, 2018 - (ACN Newswire) - The second Asian E-tailing Summit concluded yesterday at the Hong Kong Convention and Exhibition Centre (HKCEC). Organised by the Hong Kong Trade Development Council (HKTDC), the one-day event offered a one-stop platform to explore the future development of e-commerce and was attended by more than 1,400 e-tailers and business professionals from various sectors. The session began with each speaker explaining the part their company plays in the e-tailing ecosystem. Cassandra Girard, Global Vice President and Head of Consumer and Travel Industries at SAP Customer Experience, explained that she is in charge of both the consumer and travel areas because the two have a strong correlation. She said SAP has a long history of helping businesses transform from physical stores to e-tailing. "This requires a core transformation, not just a move online," she said. Her main theme was that enhancing the customer experience was the new battleground. Her company's goal is to get clients to put the customer first in everything they do. "This will result in improved marketing, sales and service," she said. Jenny Cheung, Head of Corporate Marketing for Microsoft Hong Kong, focused on how to get a clear picture of customer insights, needs and problems so that e-tailers can offer appropriate solutions. "Identifying customer insights with the help of technology and innovation is the key," she said. Clay Liao, Mobile Technical Solutions Consultant at Google, explained that Google's role was to be a bridge between Google's clients and their customers regardless of region, language or culture. "Google uses web technology behind the scenes to solve problems for its clients," he said. Another speaker at the session was Sherry Zehr, Fashion and Toys Regional Lead for Regional Brand Partnerships at Shopee, a fast-growing online retail channel in Southeast Asia and Taiwan, which provides a platform for both small businesses and large bricks-and-mortar retailers that want to add an online presence. "Shopee provides a full-service lifestyle," she explained. "It is a marketplace with social elements." It is also a channel for e-tailers to attract mass traffic, which they could not possibly do on their own. The platform offers different features, with e-tailers chatting in real time with customers, for example. "The platform translates well from social media," she said. Discussing the changes that are happening in the online marketplace, Ms Zehr said the key trend was the shift to mobile. In Southeast Asia, many customers skipped the personal computer era and went direct to mobile platforms. "The availability and affordability of smartphones has propelled the market to be mobile-driven," she said. Shopee is a leader in the region because it adds features such as games, quizzes, loyalty programmes and interaction to build customer loyalty, she explained, adding "the mobile trend will continue to grow." Shopee is also helping companies in Mainland China, Hong Kong, Korea and Japan enter the Southeast Asian market with full end-to-end logistics support, which is particularly important in countries such as Indonesia and the Philippines. Ms Cheung said one growing trend is the use of artificial intelligence (AI) and data analytics to understand the customer. This is revolutionising online searching, she said. For example, customer only need to upload a picture of what they want and the computer will find a retailer of the product. "This streamlines the online shopping experience," Ms Cheung said. Ms Girard emphasised the importance of focusing on the customer experience. E-commerce is everywhere, so it is important to build a foundation to understand the customer and use this to engage them and respond to their needs and desires, she said. The goal is to transform the experience of the customer. "Being customer-centric is a culture," she said. "It's not simply a question of using tech. Companies must transform their organisations." In response to the question of how to drive growth, Ms Cheung said: "It's really about understanding the customer." The use of AI and big data allows e-tailers to improve their conversion rate. "When companies can predict what the customer wants, they can increase turnover and reduce inventory." Ms Chow said that data is useful, but making sense of it can be challenging. It requires an innovative approach. "Companies need to find a product that solves a consumer's problem," she said. It is also important for physical retailers to integrate the online and offline experience, since a lot of people still prefer to visit a physical store. So ShopBack offers cashback offline as well. Ms Zehr said online channels can help retailers target and segment customers, so it is important to integrate the online and offline experience. "Shopee helps retailers become customer-centric," she explained. With Shopee, they join a marketplace instead of being just one isolated store online. Each seller leverages the others to build and expand their customer base. This allows very small e-tailers to join the platform and leverage the popularity of the larger e-tailers. Mr Liao shared some very important data on the importance of catching the customer's attention immediately. According to Google's findings, 53% of mobile users lose patience after only three seconds if what they see does not interest them, and every three seconds there is a 70% drop in revenue potential. "It's important to make websites and mobile apps interesting," he said. According to Mr Liao, the internet giants are all looking for the next big trend: for example, using Google Assistant not just to buy and sell things online, but also to run home appliances. One question from the audience involved concerns about the vast amount of data companies are collecting from online customers. Ms Cheung said it needs to be built on a system of trust and privacy. "We are responsible for safeguarding this information, and if we abuse this trust, we will fail in the long run," she said. The HKTDC is holding a total five events at the Hong Kong Convention and Exhibition Centre this week - yesterday's Asian E-tailing Summit, the HKTDC SmartBiz Expo (5-7 Dec), HKTDC Hong Kong International Franchising Show (5-7 Dec), Business of IP Asia Forum (6-7 Dec) and DesignInspire (6-8 Dec). These events focus on new technology and cover various stages of the supply chain, including research and development, design, production, sales and marketing. They aim to help SMEs enhance their competitiveness and cost-effectiveness and develop new business areas and markets to adapt to the ever-changing economic landscape.